Fresh off their first nine-win regular season since 2015, the No. 10 Florida Gators are set to play the Michigan Wolverines in the 2018 Peach Bowl. It is undoubtedly an impressive accomplishment for first-year head coach Dan Mullen — and a team coming off a 4-7 record last year — to achieve such a quick turnaround, finishing the regular season ranked No. 10 in the College Football Playoff Rankings and earning a bid in a New Year’s Six bowl game. Michigan, however, arguably represents Florida’s toughest challenge of the season. Although the Wolverines are reeling after missing out on the CFP thanks to a blowout road loss to Ohio State to end the year, Michigan features the nation’s top defense, which figures to offer Felipe Franks and the rest of the offense a true test. Unfortunately, history is not on the side of the Gators. The Peach Bowl matchup is only the fifth time these two teams have met on the gridiron, yet it’s been nothing but misery for the orange and blue as Florida holds an 0-4 record against the Wolverines. Let’s take a look at the series history between these two storied programs. The 2003 Outback Bowl would be the first-ever matchup between these then top-25 teams. The Gators were fresh off a loss to in-state rival Florida State but had a four-game win streak prior to that game. Quarterback Rex Grossman and running back Earnest Graham turned in impressive performances against the Wolverines. Grossman threw for 323 yards and two touchdowns, and Graham had 120 rushing yards and two touchdowns. This was Grossman’s final game for the Gators before leaving early for the NFL Draft in 2003. 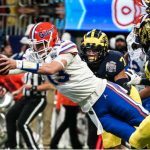 However, it was three costly turnovers and questionable coaching from Florida head coach Ron Zook that ultimately cost the Gators the victory, not to mention a career performance from Michigan running back Chris Perry, who totaled 193 yards from scrimmage and four total touchdowns on the day. Zook’s questionable decisions were highlighted by a trick play on the Gators’ final drive when they were down eight points. Moving the ball downfield, the Gators were at the Michigan 27-yard line when freshman cornerback-turned-receiver Vernell Brown received the ball on a reverse and threw to quarterback Grossman. The pass was intercepted by Michigan to seal the win for the Wolverines. This kind of coaching malpractice would prove to be all too common during the Zook era, which ultimately came to end just one year later. Out of the four previous matchups between Florida and Michigan, one would probably assume if the Gators were to have won at least one of these games, it would have likely occurred during Tim Tebow’s Heisman Trophy season with one of the nation’s most explosive offense. Alas, the Gators fell short again. The Capital One Bowl was full of storylines for a seemingly “meaningless” bowl game. Tebow was recently named the first-ever true sophomore Heisman trophy winner and was enjoying a record-setting season during his ascension to the top of college football world. On the other sideline, legendary Michigan head coach Lloyd Carr was retiring at the end of the season, meaning the Capital One Bowl marked his final game coaching the Wolverines. It was a back-and-forth affair all game long as the Gators and Wolverines traded scores. Even with a broken bone in his non-throwing hand, Tebow totaled just over 200 yards and four touchdowns, but Florida’s star of the game belonged to Percy Harvin, who had more than 240 total yards (165 rushing) and two touchdowns. Michigan, however, proved to be too much for the Florida defense. Despite the Gators forcing four turnovers, Michigan’s offense — led by quarterback Chad Henne and running back Mike Hart — was able to put up 41 points and 524 total yards on the Gators. The Gators had two chances in the final minutes to execute a game-winning drive, but a failed fourth-down attempt and four straight incompletions by Tebow on the final drive sealed the loss for Florida. Carr would end his career on a high-note with the program’s second bowl victory over the Gators. With an offense struggling to find its identity following the suspension of quarterback Will Grier, Florida limped into the 2016 Citrus Bowl matchup against Michigan. And then it completely disappeared. First-year head coach Jim McElwain’s first-ever bowl appearance with the Gators was one to forget. Over before it even started, the Citrus Bowl was an absolute dubbing by Michigan, who cruised to a 41-7 victory. Quarterback Treon Harris managed a 2-yard touchdown pass to Antonio Callaway with just under two minutes remaining in the first quarter to tie the game 7-7. But the Wolverines would go on to score 34 unanswered points with Florida making quarterback Jake Rudock look like a Heisman candidate, allowing him to throw for 278 yards and three touchdowns. Michigan would also outgain Florida by 230 total yards. The programs met up to open the regular season at a neutral-site game in Arlington, Texas. The Wolverines again were able to pull off the victory over the Gators, sending Florida its first season-opening loss since 1989. Florida’s season was also marred by the suspension of 10 players, including Callaway and running back Jordan Scarlett. 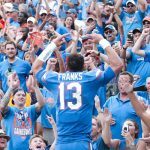 Florida started redshirt freshman Felipe Franks but also gave Notre Dame transfer Malik Zaire meaningful minutes in the second half. It didn’t matter much, though. Michigan’s stifling defense held the Gators to 192 total yards, including just 11 yards rushing. 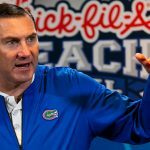 It was the start of a season to forget for Florida, who would go on to finish with only four wins and begin its search for the next head coach after firing McElwain following a loss to Georgia. Florida will get its fifth attempt at beating Michigan when these teams take the field on Saturday, Dec. 29 in Atlanta.